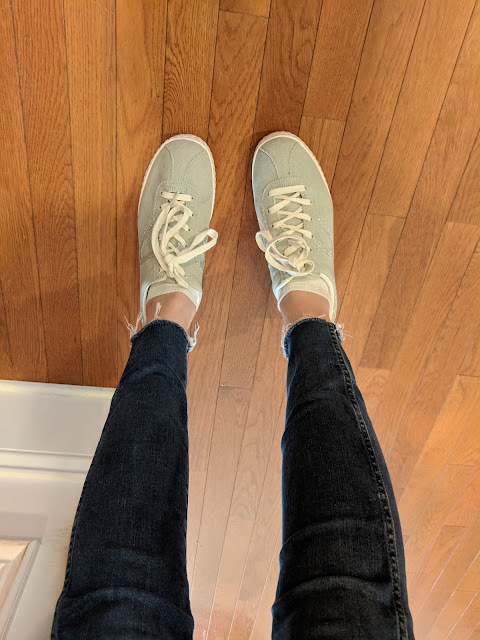 I recently bought a pair of Tretorn's , they were on major sale and I was looking for a casual pair of shoes. I rarely pay full price for clothes, they have such a huge mark up it seems silly to me. Plus there's no better feeling than finding a steal of a deal, right? Now I want a white pair for summer! They're so cute with practically everything and dress up an outfit a bit more than your average sneakers. I snagged this dress from Tuckernuck- oh, if you haven't noticed I love everything Tuckernuck sells. Their clothes are classy and elegant yet stylish at the same time. Anyways, so I got this dress to wear for Valentine's Day and love the way it fits so this navy and white stripe dress is definitely on my wish list! How cute would it look with those white Tretorn's? These pants are waaayy out of my comfort zone, I'm usually a skinny jean kind of girl, but I'm kind of opening up to the wide leg pant trend. Something I could easily throw on and be out the door and look cute. Boy, do I need a new pair of white jeans! My plan is to go to Madewell and take an old pair of jeans, (did you know they'll give you a $20 credit towards a new pair of jeans if you bring an old pair in? Doesn't matter the brand, any old pair will do! They recycle the jeans and turn them into housing insulation for Habitat for Humanity!) and try on a few different types of white jeans and see what I like. I wear my 10" high rise almost everyday so I'm very partial to getting the same in white! Get this top! It's super cute and only $24! This one size fits all shirt is in my cart waiting to hit "Order!" I just can't decide between the navy stripe or rainbow. It's a perfect transition top from winter into spring. So funny story, when I was pregnant my OB/GYN came in the exam room (pretty sure to check my dilation!) wearing this adorable dress and I just had to know know where she got it from. She told me it was Persifor and that she gets comments on it every single time she wears it. I went home and searched for the brand and fell in love with every dress they sold. They're definitely pricey and in my case an investment dress but I would wear it for years. I actually found one on sale a few months ago and it really is an awesome dress. It doesn't wrinkle so it's great for travel too. I think it's the perfect "mom" dress. I love this new print for spring! Everybody needs a new pair of sandals right? This stuff is sooo cute! Spring is so far away still, but this is really inspiring. I love that long sleeve dress!